Unlocked Pro Trader – What Would It Take? I don’t really have anything productive to say about Unhinged. It’s cool that there will be foil tokens in every pack. It’s cool that there is a new Booster Tutor variant for cubes. I hope people think they’re cute using a Legions booster and I hope they windmill a Phage. I hope someone pulls off the Voltaic Key/Time Vault combo at your LGS with that Spike card and I hope the set sells well, I open a bunch of foil Islands and they figure out a way to make a third Conspiracy set sell better if they do one. I wish I had gotten to spoil the card Ineffable Blessing, but sometimes being Mayor of Flavortown means you have administrative duties to take care of and don’t have time to approve every flavor-related thing that comes down the pipe. Stybs wrote a great article spoiling the card and even shouted out EDHRec [sic] and that was pretty cool. It was a good day today. It got me thinking about last week and some of the cards we took a look at. I see a lot of cards with multipliers that may be a little lower than either they can be or will be or maybe just cards with decent multipliers and low buy-in for non-foil meaning both prices are apt to move together. Whatever happens, we need to take a look at reprint risk before we start buying in all willy-nilly and I think today we should talk about a few juicy opportunities and how much risk is involved. Put simply, what would it take to give these cards a reprint? I was looking at the Signets, mostly. Signets are easy as heck to reprint. They go in Commander product, duel decks, goofy stuff in the future like Invaders of Ravnica or whatever they decide to do when we inevitably return to that plane. They haven’t all been printed the same number of times (7 for Boros versus 4 for Dimir, for example) but they have been in foil the same number of times, and that’s the important part. I’m not saying let’s go in on Signets, although that may be a thing considering it might be a minute before they reprint them in foil again. It’s just that Signets were the impetus for taking a look at some stuff that I may not like now but could like later. Still hovering around $8 despite the printing in Conspiracy 2 (The Conspiracy art is terrible) and like $15 is New Phyrexia, Beast Within seems a little bit tough to re-reprint. The large disparity between the two prices shows that the more desirable art is holding a premium and if this card were printed again, it seems likely that they’d use the newer art or commission a third design. A third conspiracy set or a masters set. A masters set seems the most likely and with the ability to make a masters set based on any criteria they want, this card isn’t all that safe. Again, though, I think the New Phyrexia art is safe. However, I’m not advocating the safe play here – I’m advocating the risky one. 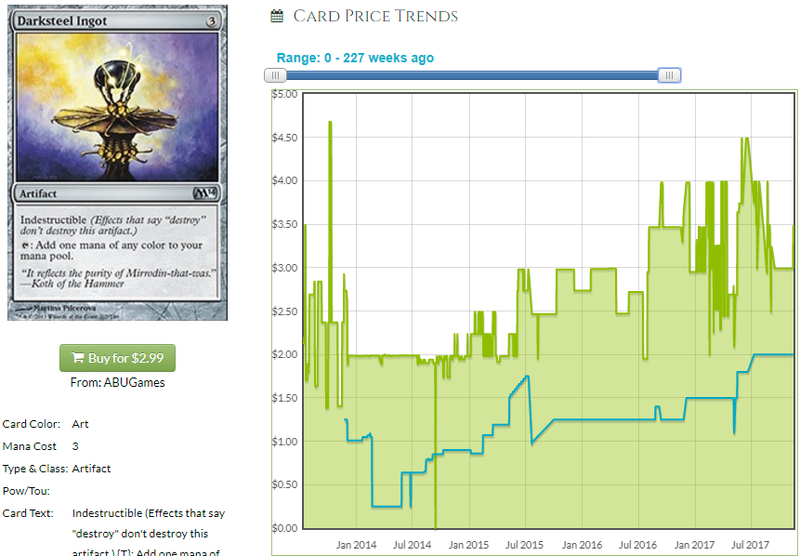 The foil prices of Conspiracy 2 cards are all super low. I don’t know how well the set sold but I know that boxes are not moving for cost on eBay so either everyone got too much of it or they just don’t want to touch it. If no one is super inclined to buy up those boxes and supply doesn’t increase anymore, you’ll have a situation where the desirable cards, especially foils, dry up. Phyrexian Arena, Expropriate, Selvala’s Blessing, The-elf-who-shall-stay-on-the-shelf and others are all in this set that’s frankly really jammed full of good stuff. Barring another Conspiracy printing (doubtful; Beast Within wasn’t in the first Conspiracy set), I think this is in a Masters set or basically nothing. I like Conspiracy foils, ugly as they are. EDH players tend to buy the cheapest copy, even when they foil and if one is half price, that one likely sells a lot first. I feel similarly about Phyrexian Arena. 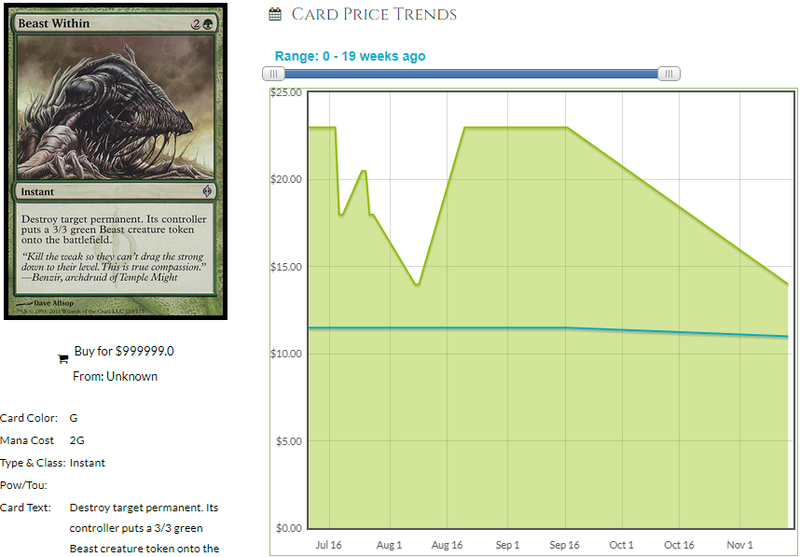 This is like a $5 card on TCGPlayer right now having sold out of smaller vendors. I think this card is about to pop and $10 isn’t out of the question. This is useful in many formats and in EDH and it can actually just KO the tokens player. With this much utility, this charm is charming as hell. So far they have only reprinted this in Commander sets. I could see a Masters set reprinting a whole cycle of these, but that’s 10 slots which is basically all of your gold slots for the set. An incomplete cycle seems very unlikely in a Masters set. Incomplete cycles of charms happen all the time in Commander product, but that just makes the foils seem even better to me. This is also a lowish buy-in for what could end up being a double-up. Where are more foil Rakdos Charms going to come from? Will there be an impetus to control the price when the non-foil is $0.25? I don’t think so. Reprints solely to curb costs are always aimed at the non-foil versions so in the case of a large multiplier, it’s only going to go up. Buying just after an increase is awkward, but if anything, the card just demonstrated it has chops and I think $10 is not out of the question. Buy as many as you will play with and maybe that number again to expose yourself to some upside. If these hit $10 you can always replace them for a quarter. In the mean time, your investment just grew 100%. I feel good about this and maybe I’m missing an obvious reprint avenue but I don’t see it. With a lot of play in EDH, this card is very strong. The mana fixing utility you get from this card and its resilience in a field full of Banes of Progress, Sages of Reclamation and Blasts of Vandal, this card is premium mana fixing. Its EDH ubiquity is indicated by its 9 printings and promo printing. Reprinted in M14 this has been foil in sets twice, though at uncommon the second time and how likely is it to be foil again? Another promo seems very unlikely as does inclusion in a Masters set where the fixing might be a little too good, even at uncommon. I think there’s a risk we should discuss before we discuss reprint risk and that’s obsolescence. Darksteel Ingot is already fighting for a deck slot with Chromatic Lantern and Commander’s Sphere and having a ton of 3 drop artifacts early in the game is very awkward. People play 2 mana ramp like Signets and Farseek because you want that turn 2 (or 1 off of a Sol Ring, you cheater, I’m shuffling your deck next game for sure. Yeah, I bet you always just get a t1 Sol Ring because you’re lucky, right Ben? I’m onto you.) ramp spell to get the game going. Hitting your 3rd land drop on turn 3 and finally playing a mana rock feels bad. Lantern is great, Sphere is great, Ingot is great. You play them. But when something better comes along, it’s likely to be better than Ingot (can you imagine a 3 drop rock better than Commander’s Sphere being printed these days?) and if you happen to own a Coalition Relic, you’ve cut Ingot already. That said, Ingot is cheap, ubiquitous, indestructible and it comes in precons so people tend to just leave it in. I think this is tough to reprint in a set that has foils in it and with the price of the foils going up recently, I really like the promo at around $4. I think it’s got more upside than the others on account of how shiny it looks. It’s roughly the same price now but it’s the easiest for a buyout to trigger and it’s going to be the first one to increase. I think obsolescence is more likely than a reprint, but for now, I think those promo Ingots are really tasty at $4 per. That’s all for this week. I might go a little deeper on that list (linked here for your perusal) of the Top 100 EDH cards with their foil prices and multipliers next week or we may have something tastier to talk about. 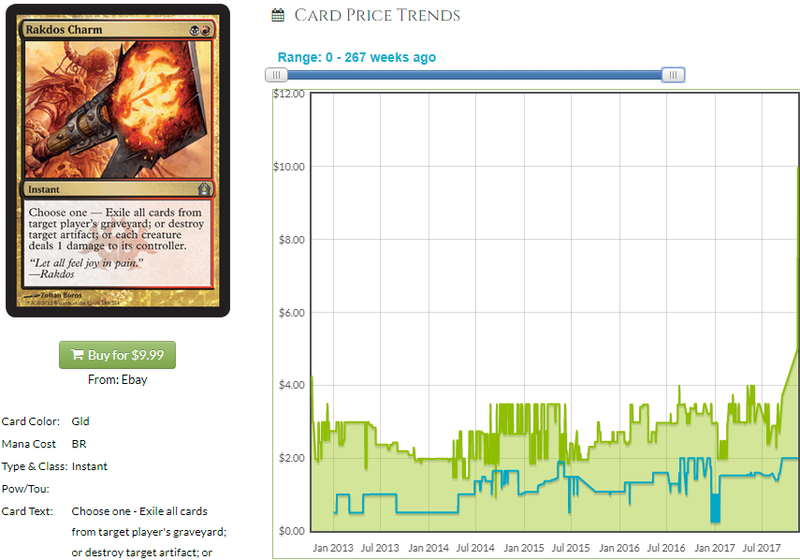 The effect of Unstable on the price of Legions packs, maybe? Who know? The important thing is that it’s been another great week writing for MTG Price. Until next time, I’m Jason Alt and you’re not.